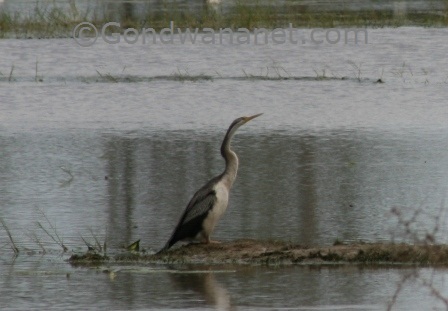 Australian pelicans, cormorants and darters are beautiful waterbirds. Pelicans, cormorants and darters are a special group of Australian birds - they are members of seabird group that, despite being adapted to a life in marine habitat, have chosen to spend most of their life in freshwater. While other seabirds are only found on the coasts - pelicans, darters and most of cormorants also inhabit Australian inland. Australian Pelican (Pelecanus conspicillatus) is one of the most impressive Australian birds, and one of the most beautiful pelicans in the world. It is a large, mostly white bird with black wing-edges, a 2.5m wingspan, yellow eye-rings and a massive pink bill. Pelicans are found everywhere in Australia (including Tasmania), except the waterless plains of inland Western Australia. They live in open fresh and salt water, often swim in flocks, and eat mainly fish but pelicans have been know to occasionally also eat ducks and other smaller birds. Australian Pelicans breed in large colonies, often on islands in flooding inland lakes, and female lays 2-3 white eggs on a rough platform on the ground. Pelicans can be seen flying alone, but often they fly in flocks, in V-shape, and at great heights. Being large birds, pelicans need to circle to gain height, and when they land, they glide low over water surface. Australian Pelicans are easy to see everywhere. They are most obvious on southern coasts of Australia, but they are also found on other coasts and in the inland. Even in big cities like Sydney they swim in the ponds of parklands and visit Fish Markets for some snack from people. In fishing villages they’ve learned that boat ramps and fishermen cleaning their catch are worth visiting, and these occasions make some good photo opportunities, pelicans are very photogenic birds. Some hot spots to see pelicans in the wild are The Lakes National Park in Victoria, and the Lake Eyre and Coorong National Park in South Australia. In Monkey Mia in Shark Bay in Western Australia which is known for dolphin feedings, there are always large pelicans on the beach. Cormorants are also saltwater birds that spend most of their time in freshwater and are therefore not only found on Australian coasts but also cover much of the inland. Cormorants often gather in large flocks near water, and often attend pelicans. There are five species of cormorants in Australia. The only exception from the fresh-water life is the Black-faced Cormorant (Phalacrocorax fuscescens), which is found along the southern coasts of Australia where it inhabits offshore rocks and islets. All the other cormorant species are found everywhere in Australia except the waterless plains in inland Western Australia. Pied cormorants (Phalacrocorax varius) prefer large areas of water and are found in coastal and inland lakes, rivers, and mangrove habitat. 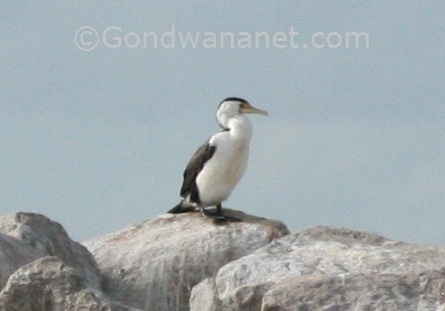 Little Pied Cormorant (Phalacrocorax melanoleucos) is the smallest of Australian cormorants and it is mostly aquatic. Little Black Cormorant (Phalacrocorax sulcirostris) lives in most estuarine and inland aquatic habitats. Great Cormorant (Phalacrocorax carbo) is the largest of Australian cormorants and it is found in all coastal and inland aquatic habitats. There is only one species of darters in Australia: the Oriental Darter (Anhinga melanogaster). The Australian Darter is often found together with cormorants, but the darter is larger, up to 95cm tall. It has a longer neck than cormorants, although it has a similar “snake-like” shape, and its beak is straight and longer than this in cormorants. Like cormorants, it holds its wings out to dry them when it is out of water. Darter is found everywhere in Australia except Tasmania and the waterless plains of inland Western Australia. It lives in lakes, rivers, swamps and estuaries and is seldom found in marine habitats. Like cormorants, darters are easily spotted anywhere where there is water.